Handb. Cacteenk. [Förster] 398. 1846 ; et: Salm-Dyck, Cact. Accepted Scientific Name: Cereus hankeanus F.A.C.Weber ex K.Schum. 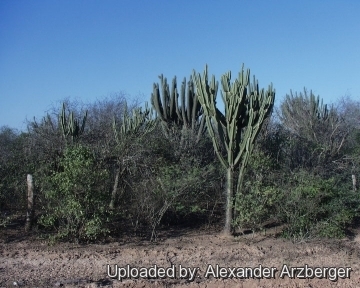 Origin and Habitat: Cereus forbesii is endemic to Argentina (Catamarca, Chaco, Córdoba, Formosa, norte de San Luis, Jujuy, La Rioja, Salta y Santa Fe), Bolivia (Chuquisaca, Santa Cruz y Tarija), and Paraguay. Altitude range: 500 to 2000 meters above sea level. Habitat and ecology. This species grows in a variety of habitats. 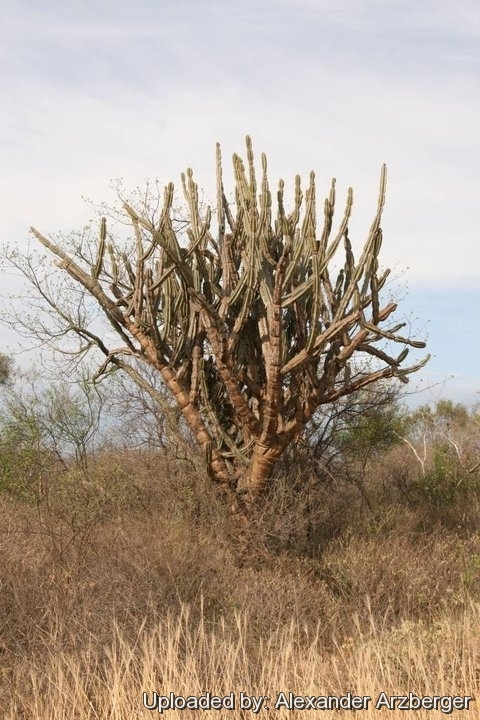 It occurs in arid plains, in forests, on hills, and on the edges of salt flats in the Chaco region among Prosopis shrubs together with Stetsonia coryne and Opuntia quimilo. Cereus forbesii is widespread, locally abundant and common, and there are no major threats affecting it. Cereus validus auct. non Haw. Cereus forbesii var. spiraliforme hort. Description: Cereus forbesii is a much branched shrubby or treelike cactus, with blue-green cylindrical-columnar stems armed with long spines. 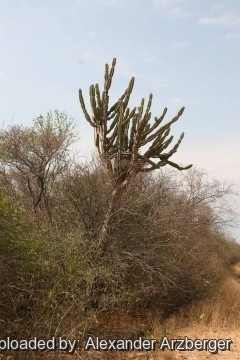 It attains a height of about 2 meters (sometimes 7 m or more tall with a distinct trunk up to 40 cm in diameter). In spring to early summer it produces large funnel-form flowers which are white or pinkish white inside and reddish in the exterior. Stem: Branches cylindrical, succulent, 5 to 10 cm thick (to 13 cm at the base), glaucous blue when young becoming grey-green or light olive-green later. Ribs: 4 to 7(-8), compressed, obtuse, 20-25 mm hight, attenuating in the older part of the plant. Areoles: Small (4-5 mm Ø), round, with scarce short yellowish-white wool becoming grey or blackish with age. Radial: about 2-5, short, stout, 1 to 2 cm long, yellowish to pale brown with darker bases becoming grey with age, mostly from the lower part of the areole. Central spine: Single or rarely 2 or 3, stouter and darker than the radials up to about 4,5 cm long. Older spine on the trunk often very long stout up to 10-11(-16) cm long. Flowers: Solitary, lateral, white to reddish,16.5-20 cm long, 8-12 cm in diameter. Pericarpel 25 mm long 18 mm wide. Tube pale green, naked with few small scales. Outer perianth-segments reddish with a green midrib, obtuse, the inner white or pinkish. Filaments white, greenish near the base. Anthers dark-brown or blackish. Pollen grains cream. Style green below, white up to 10 cm long. Stigma-lobes about 16-20 yellowish-white, up to 2 cm long. Fruits: Big, fleshy, red with a bluish pruine coat at maturity, pulp abundant lilac with small black seeds. Cereus forbesii Otto: shrubby or treelike up to 7 m tall. Ribs 4 to 8. Radial spines 2-5, to 2 cm long, centrals 1-3, stouter than the radials. Distribution: Argentina, Bolivia, and Paraguay. Cereus forbesii cv. Spiralis: Distribution: Brazil? 4) Fuentes Claros, A. F. “Contribution to the woody flora of the lowland forests of eastern Santa Cruz; additions to the Guía de árboles de Bolivia”. Revista Soc. Boliv. Bot. 2(1): 46–59.1998. 7) Kiesling, R. “Cactaceae.” In Zuloaga, F. O., & Morrone, O. “Catálogo de las Plantas Vasculares de la República Argentina, II.” Monographs in Systematic Botany from the Missouri Botanical Garden, 74: 423-489.1999. 9) Oakley, L. & Pin, A. 2013. Cereus hankeanus. The IUCN Red List of Threatened Species 2013: e.T152176A606083. http://dx.doi.org/10.2305/IUCN.UK.2013-1.RLTS.T152176A606083.en. Downloaded on 13 July 2016. Cultivation and Propagation: They are of easy culture but cold intolerant. Make sure they are not exposed to freezing temperatures ( Hardy to -2°C) or they may die. They need a well drained soil mix. Water regularly in summer but allow to dry fully before watering again. During the winter months they should be rather kept dry. Since they are rapid growers, they need plenty of space for their roots. Repotting should be done every other year, or when the plant has outgrown its pot. Sun Exposure: Light shade when young, full sun later. Propagation: From cuttings in spring (let them dry till the ends callous well). Then replant them in fresh cactus soil that is ever so slightly moist, and keep them that way till they root), or by Seeds (Seeds should be sown in a well-drained soil mix. Surface sowing is the best; seeds germinate in 14-28 days at 25° C.